I paddled past the sea wall that I thought was a marina. It was. The wind blew from the southwest. For the first hour it was a nice tail wind. When I turned the corner into Namsenfjorden the water calmed. Farther south a headwind rose and shifted to a tailwind as the fjord curved east. I took narrow pathways between islands until I arrived at a dead end, though my chart showed a passage. To turn back and go around the other side of the island would add at least half an hour to an already long day. I got out and dragged my boat up a short beach onto a road. From the road I saw the other side. Two hundred meters of low tide mud flats lay between me and smooth paddling. I slogged over the flats and resumed paddling. The wind periodically blew rain clouds overhead, but they never stayed for long. A rainbow upside down smiled at me. As I pulled into Namsos I sang songs to welcome in the Sabbath, maybe a bit loudly. When I stopped singing to ask about a guest marina the fellow above didn't really want to talk to me since my singing told him I was crazy. In the marina I met Osla who had just finished painting his sailboat. 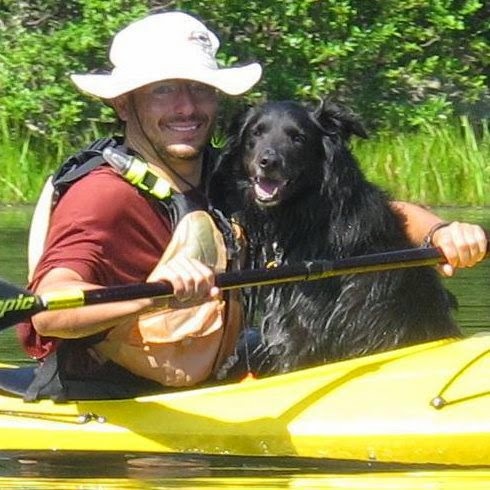 He and his wife were math and history teachers by day and kayak instructors by night. They welcomed me into their home like family and while I napped Saturday afternoon Osla went ahead and fixed my skeg. I went for a walk hoping to find a shower. I found myself walking besides a man who asked me if I was a tourist. I told him my story and he showed me where the public showers were. The village had hot showers for the workers who were rebuilding it after last year's fire burnt everything down, and I was warm and clean. I slept on the dock next to my kayak. In the middle of the night, despite the clear blue sky, my sleeping bag was damp. I convinced myself it was raining and nodded off. I woke back up, decided to get my bivi sack out, and fell back asleep. I woke up again, got the sack out, and slept 'till dawn. When morning came, with my clear consciousness I realized that the fuss I had lost sleep over was dew. Down by the water, there's a lot of it. A north wind was forecast to get stronger throughout the day. Fortunately, almost my entire route took me through tight well sheltered passages. One small rushing tidal stream connected two fjords. The ten foot wide race wound a 40 foot passage and turned under a tiny bridge before joining the next fjord. I climbed upstream with an intense and sustained sprint. "I am a beast," I screamed through my adrenaline hazed attack on the natural beauty turned wilderness enemy around me. At the other end of the fjord the passage was almost as narrow but the water pulled me a along like a fire hose and I wooted with joy. After a couple more less intense narrow passages the last four miles were into the headwind. An eagle rode the thermal vents above the edge of an island's cliffs. Between that and the island just north of it a mink scooted by me in the water and climbed up the rocks. It scampered behind a stone and then stuck its head out to look at me. I looked back, and then took a bunch of pictures. I continued my push into the headwind across the bay and was thrilled to finally make landfall. I passed a small island where some folks talked above a dock. I was tired and had been on the water for over 8 hours. I asked if that blur in the distance that looked like a sea wall was the marina I remembered from Google maps. "No, why do you need a marina?" "Sometimes they have showers and friendly folks." I said. "You can shower in our house." She told me. I was also invited for dinner and to sleep over. The next day when the weather was bad they invited me to stay until I was ready to leave. I love Norway. The sun shone all all day. In the morning I had a robust tailwind as I paddle between densely packed islands and the mainland. I stopped for a brief break and noticed an otter floating at the surface just behind me. He was either asleep, meditating, or silently stalking fish from above. It was the closest I've ever gotten to one, apparently completely unaware of my presence. I took out my camera, which made a beep when I turned it on. The otter's head shot out of the water and looked directly at me. We stared at each other for a moment. My camera made another digital sound when I hit the zoom and with a splunk the otter dived into the opaque water. I took another moment to set my camera on silent. I cut straight across a bay between an archipelago and the mainland and then headed north in only slightly more exposed water. Under a large light house I found a kind of seaweed that I had been told was edible and been meaning to try. At first the large flat leaf was crunchy and tasted similar to the other sea weed I had been snacking on. As the leaf dissolved in my mouth something happened. My mouth was full of ooze. It didn't taste bad, it just felt salty and oozy. I decided to end the experiment and spit it out. In the afternoon I paddled under clear skies over calm waters. The mountains above me stood proud in perfect kayaking weather. I ended my happy day after eight hours of paddling just north of Uran. I waited for my host to wake up. I didn't want to leave without saying goodbye and he offered to give me a lift to the marina to save me an hour of walking. At 11:00 I checked to see if he was in the house, maybe he'd gone out earlier without me noticing. I woke him. Despite his hangover, he was out of bed and we were on our way to the marina, with me once again behind the wheel. I didn't know not driving while hung over is a thing, but apparently it is. I've never had one. Kids, don't drink and drive. Also, don't put yourselves in a situation where I have to drive stick for you. I paddled on calm water across the southern end of the island and then turned into the north south fjord between the island and the mainland. I first felt the north wind that lasted all day. My progress was pitiful. So slow I couldn't figure out where I was on the chart because I thought I was much further north, and an Island connected to the mainland by a bridge hid an important land marking harbor from me. My chart doesn't show bridges, which is a defect. I stopped at 17:30 without having hit any of the distance landmarks I expected to find. I needed a toilet. Five identical red vacation homes were lined up above the water next to the small marina. The marina had a number of small cabinless fishing boats, each with five rods held ready in upright shafts. The wind made the fishing line sing. I didn't want to take an afternoon poop in the marina with people about. Looking for a bathroom I found that none of those people spoke English. It turned out they were mostly German tourists on a fishing holiday. Up at the red houses a number of them were cleaning and gutting their catch of the day. Families set to work happily with knives, fish, and a hose. Nobody knew where I might find a toilet. Nobody wanted to give me the least bit of help. I walked past the last house and found a secluded spot next to the water. I used the fish cleaning hose to shower and slept in the one boat that had a cabin. It did not have fishing rods set up as the others did and only smelled mildly of gasoline. The next day, while walking some distance from the marina I met a man who knew Schell, my Thursday night host. He had heard about me and was all too happy to host me in his guest cottage for Saturday and Sunday night. Sunday was Tisha B'Av, the Jewish day day of mourning. My skirt was a little too big for my combing; the result had been that every time I turned hard, cold water spilled onto my leg and into my boat. I tied a string around the front of my skirt solving a problem that had annoyed me for the last 18 days. It didn't seem like lowering the skeg had made much of a difference since the last time I fixed it. I checked to make sure it worked and discovered it didn't. I might be able to fix it with a hex wrench which I do not have. I weighted the stern to reduce weather cocking. I paddled in the tight space between islands and under their connecting bridges before setting out into more open waters. To the northwest the sky and sea were bright blue. To the southeast they were doom gray. I paddled the glassy sky-reflecting waters in between passed small islands. To the east bulbous stony mountains were great puffs of smoke reaching towards the heavens forever frozen, broken by fjords meandering deep into the mountains. I tried some seaweed. The leave's pea sized enclosures perpetually reached towards the surface where the sun was brightest. There was a rough sawdust after taste. I edged way over nearly using my gunwale as my keel. I held my paddle from the end and only on one side. Each stroke I exaggerated pulling water away from my bow. Barely, and only with my most massive effort, did I keep my boat going straight-ish. At least I was going fast and I soon arrived in Stokko's marina, phenomenally exhausted. There, in an unattended marina building, I found a hot shower, kitchenette, and well heated living room with a comfortable couch. The next morning the wind continued. After my own failure to fix my skeg, the locals gathered together with all their tools and wisdom to repair it for me. In the end, they told me "There's a place up north where they may be able to help you with the stripped screws," that were part of the problem. They showed me on my chart. It was a week and a half away. In the afternoon I sat at a bar to use the internet. A man started chatting with me and invited me to sleep over. Only, I'd need to drive him home since he'd had too much to drink. The last time I drove stick was in Naples after the first leg of my Spain - Cyprus expedition. That was for three blocks and the car stalled as many times. My host helped by occasionally operating the BMW's stick and telling me to press the break. Before long I figure out that by break he meant clutch and we were moving. Sometimes I did it all by myself, but occasionally went to the wrong gear. Fortunately, I managed to stay clear of the reverse, except for when I needed it and that wasn't so fortunate. That night at the beach he introduced me to Andrea, who had just come back from studying in Paris. She was a little taller than me and made a point in life a facing her fears. I wonder if she knows how long to cook peas. She wanted to hear my stories, which was good since I wanted to tell them to her, and then maybe speak of love. The young lady sitting next to Andrea got up to go to bed, but not without a long intimate romantic parting good night kiss with Andrea. Andrea told me that she had an extra bed in her room and I was welcome to stay with her for the weekend if I wanted to remain on the island for a few extra days. I went to my very comfortable bed that evening confused and slightly titillated. *Hopefully my Norwegian wife will know how long to cook the local peas, and I'll hit two birds with one stone. I paddled north under a tiny bridge and then weaved in and out around around extended seaweed rocky areas that were probably completely underwater at high tide. In the distance I saw a black buoy. Black is a strange color to choose for a buoy since they're usually designed to be visible. The buoy vanished. Twenty minutes later I saw it again. It was closer, but farther north and to the west of where I saw it the first time. It vanished and reappeared again about thirty feet from me. The seal tried to figure me out. There's something about almost every dog's face that says, "kiss me I love you." Seals seem to have that going on for them also, maybe because they look like sea dogs. In reality, seals should neither be kissed nor clubbed, respect wild animals. They're wild. I passed the Kjeungskj light house, which is a big red light house in the middle of the sea. I entered a marina in Nes to investigate. It was much too early for me to stop, but maybe I'd meet the great sailors from Kristiansund. I found a sailboat that had two sea kayaks on deck! I complimented the sailor, but she wasn't really interested so I moved on. A couple of hours before I intended to stop I saw a scary storm on the horizon. I needed to get off the water before it hit. As the waves picked up I used the distance between my fingers held at arms length to estimate the storm’s progress in my direction. I passed an older heavyset Norwegian woman in a bikini about to go for a swim as her kids watched from the rocks above. The waves jostled me up and down and crashing into the shore. She was strong! And extremely helpful. There was a marina just around the corner and the boathouse next to it had a couple beds. I could walk to the nearby farm and probably get permission to sleep in the boathouse. The beds were being use by a Lithuanian couple working in the area, but a man offered to let me sleep in his clean comfortable motorboat. I walked up a narrow gravel road through meadows and hills towards the village. I met a dog and his walker. The walker told me the supermarket was too far to walk, but I could borrow his bike. I biked the length of the island and over a bridge onto the mainland to the market. After my shopping I returned past the farms and very old small homes. When I brought the bike back the fellow insisted that I stay for dinner. His wife made an enormous amount of salad for me that was wonderful. My hosts told me that if I worried I wasn't getting enough salad, then I could and should eat seaweed. Two of the three kinds I regularly paddle through were edible and highly nutritious. I shouldn't eat too much at once however since it might upset my stomach. I set out on foot to find a wifi connection so that I could at least check the weather. The only shop in town was for fishermen. I asked if I could use their wifi connection. "We only have by phone here," the shop owner told me. "Okay, have you seen the forecast?" "Yah, it might be sunny in the afternoon." "What about the wind?" I asked. "I'm kayaking." "No wind, it's summer." he assured me. "Yesterday it was really windy." Why was I arguing? On the water there was no wind. The sea was calm. I had to cross Trondheimsleden. I could do it at the narrowest point where it turned into Trondheimfjorden and headed inland. There might be a current there, but I would spend the least amount of time in the shipping channel that way. Or I could start crossing much earlier at an angle. I'd spend much more time in the shipping channel, but I'd be farther away from the current danger zone and my overall route would be shorter. The sea was calm so I began my crossing early. As I got closer to my target island Garten at the northern edge of the fjord just off the mouth of Trondheimfjorden the wind and current picked up and my pace slowed to a crawl. 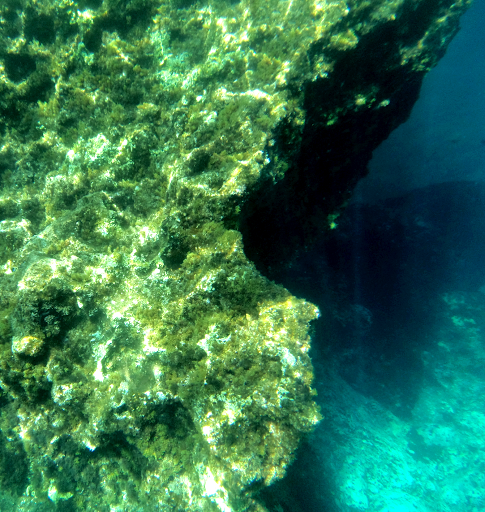 I passed a channel marker one inch at a time, and watched as the water poured around it. At the southern end of Garten, where the current was at least two and a half knots against me without the wind, I found a well sheltered bay. Though it was an hour early and about six miles before my target for the day, I pulled onto shore, changed into land clothing, and found a quiet corner of the sea for my business. The small island was mostly populated by summer homes with a few farms and other permanent residents. I asked a woman if she knew where I could find a market she said "Brekstad, it's 15 kilometers from here [you should go and never come back.]" I walked around the island looking for a wifi connection. At the end of a small sideroad near the sea two kayaks sat on the grass. I went closer to examine them. Maybe they belonged to fellow northbound expeditioners! They didn't. When I came to that conclusion the same woman who implied I should leave the island earlier stepped out of her house. "Here you are." I went back to my boat and asked for water from the family living above the harbor. They gave me water. They let me use their laundry machine, and their shower, and their wifi, and their spare bedroom, and their dog. They brought me with them to their dinner party, and were basically the best people in the world with one of the best dogs in the world. That bed was so soft. I paddled under a bridge through Skarso's tiny placid eastern fjord into Tronheimsleden. It's the central fjord which after a couple of significant twists and turns leads to Trondheim and beyond, though I wouldn't be taking it that far. Near where the the two fjords met I saw a deer and two fawns down by the water. When I got close to take a picture they fled. I paddled north east through Tronheimsleden and passed an ugly industrial building with a dock designed for a boat much larger than mine. The water around it was bubbled slime in the light chop. I left the building behind and an eagle swooped overhead. They're huge. I enjoyed a robust tailwind. Going strait was hard, which oddly was not alleviated by lowering my skeg. I'd have to pack my boat so that it would weathercock less. I tried to hug the shore, there was a better chance I'd find the plaque that way, but a number of smaller fjords that were not on my route branched off so crossed them at the skerries. I paddled to an island and around a fish farm and then another island. Finally after one larger crossing I squeezed between a final island and a point against a mild current to arrive at a Hennskjelo. The water was glassy flat and two great blue herons swooped about with each other just before the first house. A large barn sat just above a dock with an old kayak out front and an open door. I kept paddling. A man stood next to a boat house. "Hi," I said. "I kayaked here from Alesund. Can I sleep in your boat house tonight?" "No." He told me. "I don't like this." "Thanks anyways. Have a good night." "Enjoy your trip and good luck." I paddled through a narrow space under a bridge that connected the island to the mainland. A woman asked if she could take a picture of me and I said sure. I asked her to email it to me and she said sure. She did! I think that's the first time anyone has ever followed through on a random kayaking picture email. Just after the photographer was a marina. I pulled up and used the hose for a quick shower. A fisherman pulled up, offered me a fish he just caught and a bed on his extremely filthy boat. Life couldn't have been better. It turns out fish are easier to gut if I cut the head off first. In the afternoon I asked the ferryman if he knew where I might find a wi-fi connection and before I knew it I was showering in the ferries spacious underbelly. After my shower, towel provided of course, I had PB&J sandwich from the kitchen while reclining in a deeply comfortable chair and talking with my new friends the ferry crew. The ship moved back and forth across the fjord while I sheltered in style in its underbelly. The ship's engineer was there in case something went wrong. If that happened he wouldn't know what to do. The guy who directed traffic on top had better English and asked me about America. He periodically disappeared to direct traffic. We watched a program on television that showed a boat traveling up the coast of Norway. The boat's famous and when people know it's coming they go out and wave Norwegian flags, so that they'll be on TV. The scenery on the program was fantastic, almost as nice as what I could have seen from up on deck, but I was quite content in my warm soft chair. I turned from a narrow fjord into a more winding one. I passed a town that might have been my last supermarket for a while so I stopped to go shopping. I think there's something about Norwegian culture that makes it especially impolite to mind someone else's business, ask about their kayak, introduce yourself, offer a stranger a shower without him directly asking for one, or commenting on him wearing a wet suit in a supermarket. When I introduce myself to Norwegians I find they're overwhelmingly polite, but trying to subtly get them to offer something without directly asking for it, is usually futile. Another kayaker in a kayak nicer than mine (a Nordkapp) was paddling with a beautiful homemade Canadian inuit paddle southbound. He had started in Bodo, my most likely take out, in May and was heading to Bergen. So far had lost 15 days to bad weather and expressed the supreme frustration that I knew all too well. My frequent tailwinds had been his headwinds. He used to have a dry suit, but he discarded it with his spare paddle and lots of other unnecessary gear a few weeks back. He never capsized and paddled in a long sleeve wool shirt under a poorly fit life jacket. His deck was covered with more clothing that he had stripped off throughout the first wonderfully sunny day in ages. We talked joyfully, since we were both the only fellow long distance paddlers we had met. He told me of what I could expect ahead and I him. Eventually we parted, since we both still had a long ways to go. I try to paddle between seven and eight hours a day, though sometimes it's closer to six. I added an hour onto the end of my day to make up for time lost shopping. I stopped to change chia drink nalgenes at a dock. A man was working on the dock and was excited to see me. He had talked to me at the ferry. I didn't remember him. I'm terrible with faces. Was he the engineer who let me shower and was full of kindness? Or was he one of the random people in cars waiting to get onto the ferry that I asked for wire hangers to rescue my knife. I didn't know. I turned around one last narrow corner into a fjord that was nearly closed at both ends making for a very peaceful body of water. At the far end of it, in Aure was a sea wall protecting a dock. On that dock there was an unlocked sailboat that was my home for one rainy Shabbat. After Mr. Barnes helped repair my skeg I was off feeling good despite another rainy day. I think part of my problem, aside from the shortage of showers and associated chafing was that Norwegians seem to be more withdrawn than Meditteranians. It was really nice to enjoy sailor's hospitality. I paddled off my chart and won't be on the next one till tomorrow. When I was getting ready to call it a day I waved down a motorboat to ask for directions. I was in the wilderness. There was nothing for miles in either direction. The last settlement I had seen was 40 minutes earlier and the next, the motor boat man told me, would be in 14 nautical miles, almost five hours of paddling. There was nothing until then he assured me. I didn't want to paddle forward another five hours and I certainly didn't want to paddle back for 40 minutes. I wanted a boathouse. It was raining. I didn't want to make camp in the rain. When I was ready to give up on my lengthy inquiries with the motorboat man, who was traveling at 28 knots from Trondhiem to his summer cottage, suggested that I try the village just around the corner. In twenty minutes I found the village that google maps told me might or might not be a village. There was a dock and above it a boathouse with a substantial awning that could keep me dry in all but the worst storm. I had everything I needed. That night the storm's worst came. Horizontal rain drenched my sleeping bag and my things at 2:00 am when I scurried to get out of my bivi sack and close my dry bags. At 3:00 am I looked up at the line above my head where I hung my dry top in the evening. It was gone. I climbed down the sea wall to pull it out of a heaving bed of surf and seaweed, washed it off in a local stream as the heavens crumbled around me and went back to sleep. At some point in the night I heard the wind blow my knife off the table. In the morning I found it on the rocks beneath the deck's floorboards. It had fallen between the cracks. Aside from serving as my spoon since I lost my regular spoon in Geiranger, I also need my knife for safety issues like getting caught on a fishing line. It had a special way of attaching to my life jacket and I liked it. I asked the men on the ferry boat if they had a wire hanger. They did not. Rain poured all morning. My Gore-Tex shell has lots of holes in it; it's come quite a long way with me and is no longer the least bit waterproof. My rain pants are still pretty good though. I knocked on the door to a house and the grandfather that opened it brought along some thin flexible aluminum rods. Just as I was getting it out, the ferry man showed up with a magnet, and together we finished the job. It was noon. The temperature was 46 Fahrenheit. The fjord was not calm and the rain kept on coming. I decided to take the rest of the day off.